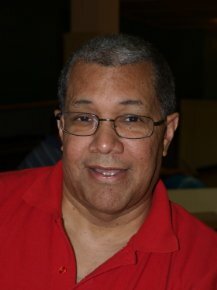 Featured Author: James Robinson, Jr.
James Robinson Jr. is here on his Orangeberry blog tour to talk about Fighting The Effects Of Gravity, his memoir about life. Welcome, James, tell us a little bit about your family. I had a very interesting home life—so interesting in fact that I chose to include large amounts of it in my book: Fighting the Effects of Gravity. I am an only child. Both of my parents are still living. My father is 85 and my mother is 83. Both are now retired. My mother was an educator who went on to start her own after school in 1972 and later opened a pre-school in 1984. My father was the famous one of the family—-so famous in fact that my young cousin—-when he was about ten years old—-said: “Uncle James, you’re famous” and began referring to him simply as “famous.” My father was a great athlete who was the first black to play football for the University of Pittsburgh in the mid-forties. He went on to become a Presbyterian minister who was very active in the Civil Rights Movement in Pittsburgh the 60’s. He met Martin Luther King at one point who—-when he ran in to him again—-didn’t call him famous like my young cousin did—-but did refer to him as “Pittsburgh.” My parents opened a charter school on the northside of Pittsburgh ten years ago for grades K-8, which will solidify their legacy. My grandmother and grandfather on my mother’s side were probably two of the nicest people I ever met—-the fact that they were related to me notwithstanding. My father—-who claims he pretty much disowned a large portion of his family due to their dysfunctional ways-—adored my grandparents. When I began writing Fighting the Effects of Gravity and relating anecdotes and it became as much a memoir as a treatise on midlife, I realized that my grandparents and my parents—especially my mother—and later my wife had the most profound effect on my life. I realized that I could be a writer when I started writing Fighting the Effects of Gravity and something clicked for me; I discovered a style of writing that I didn’t know I had. Writing non-fiction and writing about my own life gave me a new insight on writing. I realized that maybe non-fiction was a better fit for me because of my sense of humor and style. Have you ever had writer’s block? There is no such thing as writer’s block, just writers who don’t feel like writing for the time being. It’s been so long since I undertook this project that I can’t really remember exactly how I came up with the title. I remember I was working with a gentleman who runs a local Pittsburgh publishing company who was the first to publish the book. The two of us came up with the definitive title. Why did you choose to write this particular book? It seemed like a natural. I was reaching middle age and the story about my ill-fitting jeans came to me and seemed like I could center the book around that idea. Everything grew from there. I have always liked the quote from the Indian warrior Crazy Horse who, before the battle of the Little Big Horn, was heard to say: “It’s a good day to live, it’s a good day to die. Brave hearts to the front. Cowards and weak hearts to the rear.” I like the quote because I think it speaks to the courage to take life as it comes and to live life on your own terms. In the book, I have an entire chapter devoted to death and state that the hope that—when I’m confronted with death—-I will make Crazy Horse proud, that I will put my life in God’s hands and accept my fate with grace and bravery. At the end of the chapter I recommend—tongue in cheek-—that a drill sergeant wake us up every day and drum into us the fact that every day is a blessing and that we should live every day as if it were our last. Jennifer at Hot Damn Designs along with her associate Kim Killion designed the cover. I originally had a cover that most of my friends and associates thought was a bit juvenile for the mature level of my subject matter so I decided to make a change. I gave Jennifer a photo and she actually found another photo that looked a little more suitable. I simply made suggestions and corrections as we went along and she did the rest. I published my softcover book through Create Space which is Amazon’s publishing arm. I actually went through iUniverse first which was fairly inexpensive and their editors and staff provided me with sound advice but, ultimately, I couldn’t get the control that I needed to promote the book. But on the other hand, it was iUniverse who provided me with the final edit of the book—the version that is available for sale now. While I thought that the version that I presented to them was good enough they suggested an exhaustive, thorough edit, which would make the book as good as it could be. I agreed and—though the edit was expensive—it was the best thing I ever did in terms of writing. The edit literally changed my life in terms of writing style, grammar, and punctuation. I didn’t do a total re-write of the book but entire sections were removed, and I wrote five new chapters. Short, undeveloped points that I made from the old introduction became new chapters and I created a whole new intro. Like the Army motto, I want to be the best writer I can be. I want to continue to hone my style and branch out into other genres. For me, writing is hard work and I want to keep writing and stay viable and fresh. My immediate goal is to get my sales up and to get more reviews—more reviews will eventually lead to more sales. I’m currently working on a novella which is a totally different genre for me altogether. This book—-called The Airport—-will deal with a family who confronts their problems and their demons during an airport layover. The book can best be described as a romance and will, hopefully, bring a whole new audience to my writing. Fighting the Effects of Gravity is an Indie Excellence Award Finalist and recipient of a Readers Favorite 5 Star Review. James Robinson, Jr. had it all: three beautiful children, a loving wife, a new home, a good job. But at age 36, the bottom would literally fall out of his life. He would watch his once firm deriere fall overnight never to rise again–-succumbing to the evil forces of gravity. 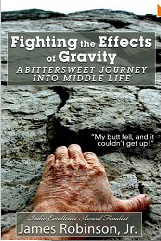 Fighting the Effects of Gravity is a humorous, midlife, memoir full of anecdotes and life lessons. You’ll find yourself laughing out loud at the author’s experiences and how much they relate to your own. Life is short; don’t let gravity get you down. Connect with James Robinson Jr.